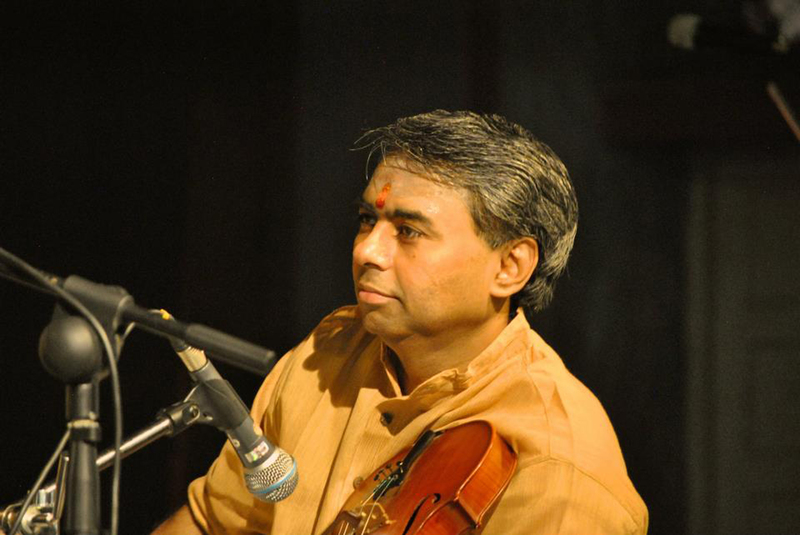 He is the preferred violin partner of many a senior Carnatic vocalist. A master of the art of accompaniment, he scrupulously restrains himself to faithfully follow the contours of the essays of the main artiste, yet manages to carve out his own nuanced brand of manodharma when the flow of the concert inspires him. His solo concerts are models of virtuosity tempered by restraint. Few musicians seem to have internalised the essence of the great Carnatic ragas as violinist RK Shriramkumar has. Shriramkumar enjoys the impeccable legacy of the Sanketi-speaking Rudrapatnam family of musicians from Karnataka. A grandson of eminent violinist RK Venkatarama Sastri and a grandnephew of Sangita Kalanidhi RK Srikantan, he was born on 4 October 1966 to Kusuma Krishnamurthy and RV Krishnamurthy. He had his early music lessons from Savitri Krishnamurthy and advanced training from his grandfather. He was also one of the prominent students of vocal music taught by the late DK Jayaraman in his heyday. At present he receives mentoring from violin maestro VV Subrahmanyan. Though Shriramkumar has accompanied many past masters like D. K. Jayaraman, D. K. Pattammal, K. V. Narayanaswamy, Semmangudi Srinivasa Iyer, T. Brinda, T. Viswanathan and S. Balachander, he probably regards practising and performing with MS Subbulakshmi and travelling with her on her concert tours as the most prized experience of his life. To his immense credit, he gave her outstanding support on stage during the last part of her glittering career. For over two decades, Shriramkumar has performed at all the major festivals in India and for Sangeet Natak Akademi, the ICCR, the ITC Sangeet Sammelan, the Rajiv Gandhi Foundation, All India Radio and Doordarshan. Known for his deep scholarship and understanding of the theory and practice of Carnatic music, Shriramkumar is a popular and lucid presenter of lecture-demonstrations on the finer points of his art. A firm believer in learning the intricacies of ragas through assiduous practice of the compositions of the great vaggeyakaras, he has over the years helped audiences gain greater understanding of classical music. In collaboration with fellow artistes of the likes of TM Krishna and K Arun Prakash, he has pioneered several outreach efforts at spreading classical music far and wide. Like many leading Carnatic musicians Shriramkumar has been a globetrotter several times over, but retains his natural simplicity and unfailing courtesy in his interactions with peers, seniors, juniors and rasikas. A mathematics graduate of Madras University, and a well-read scholar of authentic texts on music, he is also an articulate spokesperson for traditional values in music.